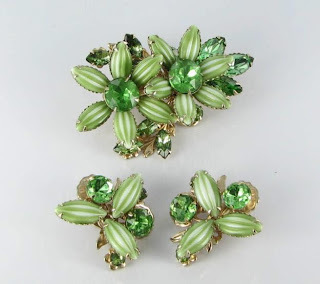 This week's vintage jewelry find is a gorgeous art glass and green rhinestone demi parure. It is to die for! The set consists of a brooch and matching pair of clip back earrings. The stones in this demi are so special. They are marquis shaped and have a lot of texture to them with both pale green and dark green veining. The design is finished off with prong set medium green rhinestones. There are no markings on the pieces, but they have all the ear marks of an unsigned Beau Jewels set with the layered design, fancy stones and filigree settings. This lovely green art glass demi parure is available at Vintage Jewelry Lane for $89.99.